Doors open at 6:00 PM! 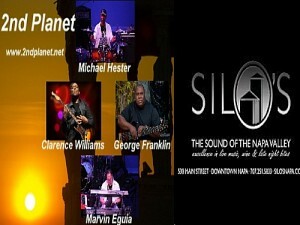 Reserve your tickets and join 2nd Planet’s post-holiday performance at SILO’S located in the beautiful Napa Valley downtown district on Saturday January 9, 2016 for 2 shows at 7:00 PM and 9:30 PM. SILO’S is Napa Valley’s premier intimate music venue that offers fine dining menus, fine wine and the perfect atmosphere to socialize with friends and family. In addition to performing some familiar song selections, 2nd Planet will perform music from their latest CD release “The Next Level” and debut release “Beyond the Surface” in addition to selections from 2nd Planet’s bassist George Franklin’s CD release titled “Always” which contains a selection that features legendary jazz keyboardist Bob James.